The Face of Beauty International pageant was held in Mongolia from September 27 to October 9. Russian contestant Alena Raeva, who received the title Most Beautiful Face of the World 2016, shared with Sputnik International her impression from the pageant. 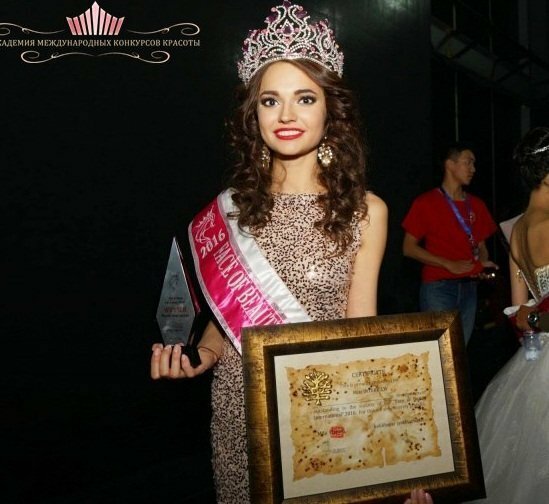 Regina Konstantinova — "Face of Beauty International took place in Ulan Bator, Mongolia. The participants from 60 countries, such as Spain, the US, Africa, China, Portugal, Japan and many others, competed for the title in this project," Alena told Sputnik. There were a few interim stages throughout the pageant, such as a sports contest, a creative contest, a separately held bikini contest and a national costumes show. "I always made it to the top 15 in every contest thanks to the good luck," she added. Twenty-two-year-old Alena, who lives in Krasnoyarsk, works as a journalist at a local broadcasting company and studies at the Saint Petersburg University of the Humanities and Social Sciences. In addition, she has always found enough time to participate in different international competitions since she was 17. "The Academy of International Beauty Pageants, with which I have been working for years, offered me to try my hand in this contest… And I agreed! This was my fourth project, so I didn't meet any difficulties," the Russian beauty explained. "My mom is a very creative person. Even when I was a child, she always sewed the most colorful costumes for me for the New Year masquerades! I think this time we've managed to do it once again!" One of the most important home tasks was to prepare a video presentation on the theme "Save the Mazaalai," Alena revealed. "A type of brown Gobi bear known in Mongolian as Mazaalai is on the verge of extinction: there are about 30 individuals left in the world. Contestants had to specify how to save this species from extinction. We all have done a great job and received high marks," she said. "I didn't set a goal to win this contest. I went there primarily to explore the country, meet interesting people and immerse myself in the atmosphere, in which I feel as comfortable as a fish in water. Shows, competitions, communication with girls from different countries — this is what I truly enjoy." Though she couldn't deny she was absolutely happy to win: "Representing my country and taking home the main title of the competition, I experienced incredible feelings of joy and pride!" Obviously, Alena's victory sparked additional interest in her personality. "There are a lot of offers in advertising, an offer from television and even an offer to become a member of a female music group."